Man, what a gloriously lazy day we had today. We slept in late, squeezed in multiple naps, dozed in between those naps, and honestly, I’m getting pretty sleepy as I type this and will call it a night afterward. That’s one of the upsides/downsides to having such a cozy Halloween nest for a living room. You just want to lay down on the couch and waft on to dreamland in the orange glow. I’m a big fan of encouraging people to get out and make it an active season, but if you decorate your living room just right, a homebody Halloween is pretty great, too. We figured that since we’d packed yesterday with activity of the autumnal sort, we’d take it easy today. We had one errand to run, and that’s the only reason we even left the house. Well, we could have put off that errand, but it was so delightfully cool outside that we wanted to get outside a little. As part of that, we picked an outlet mall to maximize our time outdoors on this errand. As we wandered the shops, I kept my eyes peeled for cool fall stuff. Didn’t see much, really. Lindor was pushing its pumpkin spice chocolate truffles. The Disney Store had costumes and a small selection of Halloween items and a slightly larger amount of The Nightmare Before Christmas merchandise than usual. I said this next bit on Twitter, but we're at that crossover point where summer people are clinging to T-shirts and shorts and autumn people are wearing sweaters like they're political statements. So it’s kind of weird to be out in public right now. I was, of course, on Team Sweater. Eventually, we got what we came there for and grabbed some food on the way home. Which we ate while watching Alvin and the Chipmunks Meet the Werewolf (2000). This movie and Alvin and the Chipmunks Meet Frankenstein (1999) are both great Halloween movies. More people should be talking about them this time of year. They’ve got great atmosphere. Engaging stories. Are extremely monster-focused. And have a couple of cool numbers. The Things Out There song on Frankenstein should be on everybody's Halloween playlist. Well, maybe a version covered by somebody else. It’s so strange that the defining element of the Chipmunks concept (that they sing in gratingly high-pitched voices) is also the worst part about it. The rest of my awake time today was devoted to writing. 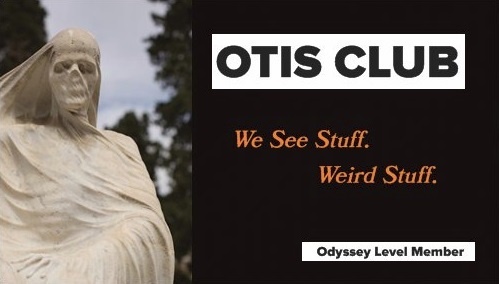 It’s OTIS Club Newsletter Thing Day, so I spent time on that (it featured a Strange Stuff from my Study entry), and then I had to work on another writing project. For the next few days, we’re supposed to be getting the rainstorms that the lower east coast got all weekend. I’m ready for ’em. The shorts crowd probably isn’t.